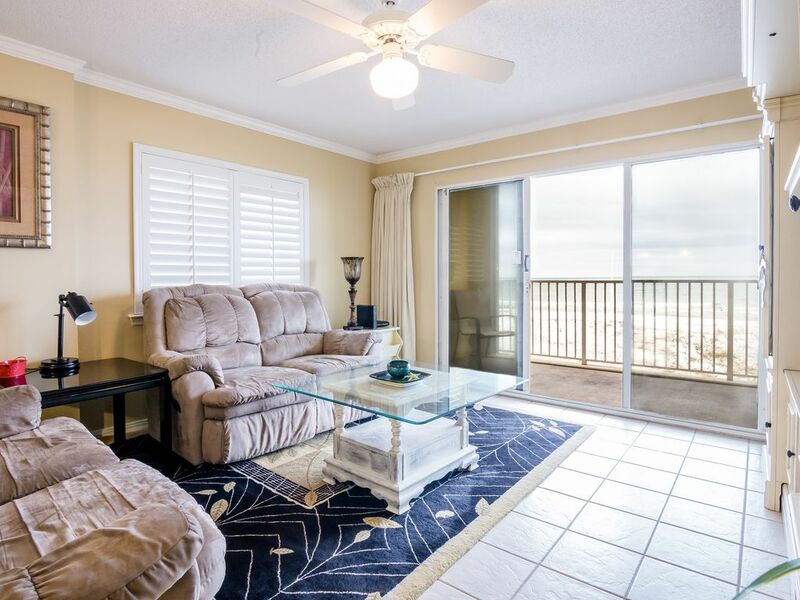 Spacious beachfront corner unit: 3BR/3BTH! Panoramic ocean views! ** 2nd Floor corner unit with panoramic beach views from the spacious balcony, the living room and the master suite. ** Tasteful, stylish decor with all the comforts of home -- feel welcome and relaxed as soon as you arrive! ** Kitchen features granite counter tops with breakfast bar and stainless steel appliances. ** Master bathroom has garden tub, stand up shower, and dual sinks. Each bedroom also has its own private bathroom entrance. ** Flat screen TVs in each bedroom. ** Plenty of parking at the Gulf Dunes resort complex. ** Short WALK to the Boardwalk, Restaurants and Pier. Imagine waking up in the morning to a beautiful sunrise peeking through the curtains of your bedroom. You open the patio door, step outside and inhale the ocean breeze. The ocean is right there in front of you! You can relax on the patio with a cup of coffee while watching the waves, or you can take a morning stroll on the sand. need to put your shoes on! Later on a dip in the pool is always a great idea. And if the kids decide to spend the whole afternoon in the water, you can easily keep an eye on them from the balcony while sipping a chilled drink or relaxing in the shade. For dinner there are plenty of choices, including some great restaurants within walking distance. Or you can stay in and dine with the sunset. • AJ s Oyster Shack: Great sea food, live music, friendly staff!!! The bed options in the unit where perfect for our two weeks with family. This kitchen was outfitted the best I have experienced. The unit does need a deep cleaning, some repairs and new towels. Thank you for choosing Gulf Dunes 201 for your family vacation and for taking the time to leave a review. Feedback from guests is very important and helpful in improving the unit in any ways possible. I will greatly appreciate it if you can send me an email with some more details on any items in the condo that you felt need repair. Thank you again for being a responsible and caring guest. I hope that you come for another visit very soon. Size was perfect for large family (7)! Having 3 bathrooms was really a plus. The kitchen was well stocked & roomy. The view was amazing!! I love Okaloosa island & have been vacationing there for many years. Will definitely keep this rental on my short list for future visits!! The weather was beautiful as I had taken three grandchildren(who were on spring break from high school) and daughter. We spent afternoons at the beach and then would continue relaxing by the pool. The unit had extra small appliances in the kitchen which really helped preparing meals when not dining out at our favorite restaurants. Also, did need a T V replaced and in one phone call was assured it would be replaced the next day as it was. Would absolutely return, thank you! Thank you for staying at Gulf Dunes 201 and for taking the time to leave a review. I'm thrilled that your family had a great time at the condo and would love to welcome you for another stay.